Artist Masud Olufani sketches Pelham resident. Photos by Karie Denny. Scalawag recognizes and is grateful for the work of Southern artists. It was in the spirit of gratitude and generosity that back in February of 2018 we partnered with 100 West Corsicana artist residency to send brilliant Atlanta-based visual and performance artist Masud Olufani to rural Texas for a month of art-making and community engagement. At Scalawag, investing in Southern journalists looks like hosting free skill-shares, mentoring reporters, and paying them fair money for their work. Investing in Southern artists often means finding ways for them to create and think free from financial strain. Investing in Southern artists often means finding ways for them to create and think free from financial strain. This was our first partnership of this kind, and we were truly excited. It touched on many different aspects of our mission— from supporting Southern Black creatives and writers, to engaging rural communities within their own contexts, to celebrating Southern imagination, and partnering with other local nonprofits. We had no idea what would come of the residency and what kind of blueprint this partnership would form for future arts initiatives. All we knew was that we were helping to make necessary and gorgeous art. In Texas, Masud spent his time researching oral histories of the descendants of people enslaved in Pelham County’s cotton industry. 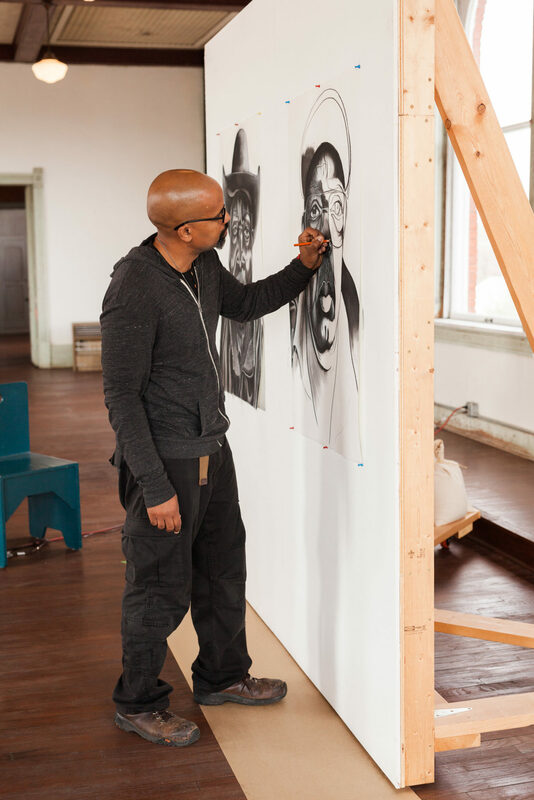 After conducting site visits and numerous interviews, he created larger than life portraits of community elders. And he began dreaming of a larger installation, where viewers would wade through windswept grass and cotton to study the faces of the descendants of individuals who labored hard for neither wages nor gratitude. At the end of his residency, 100 West Corsicana, the G.W. Jackson Society, and Scalawag co-hosted an artist talk, where Masud discussed his practice and performed a one-act play about the enslaved master potter, David Drake. For the performance, Black and white residents of Corsicana gathered with artists who drove down from Dallas. It was perhaps one of the few times that such a diverse audience had gathered in Corsicana, which is still largely segregated along racial lines. Masud paid homage to David Drake in a building that previously hosted Klan rallies, while the audience reckoned and wrestled with past and present. People wept, and began to consider the implications of such a narrative for their own small town. Masud paid homage to David Drake in a building that previously hosted Klan rallies, while the audience reckoned and wrestled with past and present. Hugs from the president of the G.W. Jackson Society. Discussing the intersections of art and journalism with residency founder Kyle Hobratschk. While in Corsicana, Masud and another writer at the residency, Anna Badkhen—who has dedicated much of work to exploring the lives of folks throughout the Global South—spoke out against a piece of public artwork in the local children’s playground. The zoo-themed playground featured exotic animals, all of which were freestanding except for the gorilla, which was depicted with bulging eyes, and a Sambo-inspired grimace. Only the gorilla was in a cage. Writing about his experience, Olufani said “There are moments—fleeting, evanescent, and ephemeral—when a word or phrase can suddenly change a face wreathed in smiles, to one burdened by a sorrow and pain so ancient and deep, that it seems to have come from another time, passed down from one generation to the next—an inheritance of invisibility, of erasure and neglect. Such was the case when I asked an older black resident of Corsicana about the peculiar statue in the children’s playground…” At the artist talk, both Olufani and Badkhen commented on the history of images and iconography and how damaging, unwelcoming, and racist that legacy was. Needless to say, this created a stir in the small town, resulting in the immediate removal of the gorilla. A public debate followed, as well as a few reports of racial slurs written on a local Black memorial. Finally, the gorilla made a subsequent return to the playground but only after being painted a monochromatic grey and being removed from the cage. The gorilla is not important here, but the dialogue that happened in the town was. Many white residents heard for the first time how incredibly hurtful a playground statue could be. Many Black residents felt seen and valued by the town’s willingness to act. And all grappled with a history of images that is inseparable from a history of violence. Art can denigrate, but as our pilot artist’s residency proves, it can also dignify. Scalawag will be there to document and provoke. Karie Denny is the photographer and Creative Director for Ace & Whim. In recent years, Karie Denny has become the Main Street and Tourism Director for the City of Corsicana, where she brings her passion for community and creativity together with constant improvement and love for people.